2.25 p.m. R4 13 Saffron Lady (5 m Iffraaj – Colourfast, by Pentire) – Jake Bayliss; had a tough run, three wide without cover, in a strong field for the Rating 75 1600 metres here on 8 April, after closing solidly for second on 23 March in the Rating 70 1600 metres at Avondale. Likely to be ridden with more patience from barrier 10 in the $25,000 Rating 75 1600 metres, her sound course record includes a win and she should handle the going if not too testing. Fixed odds: $16.00 & $4.50. 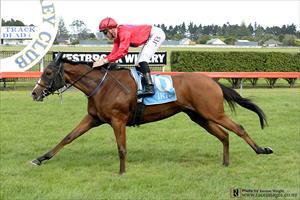 3.19 p.m. R7 16 Za Za Gabor (3 f O’Reilly – Zaza Top) – Terry Mosely; worked hard to situate outside the leader in a competitive running of the New Zealand Bloodstock Insurance Stakes (Listed, 1600m) here on 7 April, and contests the $50,000 NZB Warstep Stakes (Listed, 2000m). Drawn wide (12) in a stronger field, luck in receiving a favourable trip can coincide with an improved performance. Fixed odds: $61.00 & $13.00.